We’d love your help. Let us know what’s wrong with this preview of Crowds and Power by Elias Canetti. To ask other readers questions about Crowds and Power, please sign up. i want to read this book any one can help me to download this book free? An astounding book. It reads like a series of essays by Montaigne but all directed toward the phenomenon of human organisation. Each essay, which might include references as diverse as the anthropology of South American tribes to the history of European warfare, contains some comment which is not only arresting but revelatory of profound insight. Who knew that an apparently sociological treatise could be so creative, so enthralling, so literate? Crowds and Power is also something like Dr Johnson's dictionary. It shows Canetti's pet-peeves and prejudices as well as his erudition. Canetti's world is one composed of human groups rather than words, but his achievement is to describe these groups and their dynamics as had never been done before. His unit of analysis is the crowd, which may arise from something more primitive called a pack, but which takes on uniquely crowd-like characteristics and force. The crowd, depending on its type, of which there are several, has an implicit crowd-mind, not dissimilar perhaps from the hive-mind of bees (or ten-year old girls). After establishing his basic crowd-typology, Canetti presents page after page of remarkable observations and conclusions about what makes each type behave as it does. Only a few of his crowds could be termed mobs. Most are institutionalised, or 'closed', crowds, the primary issue of which is to prevent them becoming anything like a mob, which is 'open'. Prototypical of an institutionalised crowd is religion. Religions 'domesticate' crowds through precisely controlled ritual. Congregants must be united but not excited enough to press for too rapid expansion nor irritated enough by its demands to provoke departure. Consequently: "Their feeling of unity is dispensed to them in doses and the continuation of the church depends on the rightness of the dosage." Parliamentary crowds, that is democratically elected Party-affiliated representatives, are an example in a modern form of bloodless warfare. Parliamentary crowds are only possible because the losers in democratic election are not killed or physically harmed. This is the reason, of course, that Trump’s threat to prosecute Clinton during the American election campaign was implicitly treasonous. It was a threat not just to Clinton but to the essential conditions of elected government. The very solemnity with which elections are conducted, argues Canetti, derives from the renunciation of death an instrument of decision. His discussion of National Crowd Symbols is presented almost as an aside but is particularly thought-provoking. Some are obvious once stated: the Sea for England, Barriers Against the Sea in The Netherlands, the Mountains for Switzerland. But one tends to forget that these are far more than clichés. They have an emotional significance that is real (the last night of the Proms comes to mind, as does the role of the Dijkgraaf in the political unity of Holland). Others are less apparent but of very practical historical import. For example, the Marching Forest of the Army in Germany, a symbol of pan-Germanic strength and unity created by Bismarck was fatally disgraced by the Treaty of Versailles. It is Canetti's not uninformed view that "Hitler would never have come to power if the crowd of the army had not been prohibited by Versailles." Like Dr Johnson, Canetti inserts more than one or two private prejudices into his analyses. Islam, he believes, is inherently a religion of continuous warfare as indicated by selections from the Quran. But similar references in the Christian and Hebrew Bible are not quoted. Christianity is a 'crowd of lament' for a slain god, and thus one in a line that stretches from the Babylonian cult of Tammuz to the various mysticisms of the Australian aborigines. This is an interesting hypothesis which has been articulated elsewhere but with neither discussion nor additional confirming material in Crowds and Power. Canetti's final chapters on the use of power within crowds, to manipulate and lead them, are less satisfactory than his analysis of, as it were, naked crowd dynamics. But even here his insights are at least as provocative and stimulating as most organisational theorists today. His definition of the 'increase crowd' which is crystallised around an associated 'increase pack' is not an irrelevant way to view modern corporate organisations. Given its date of publication (1960), Crowds and Power is a rather sophisticated appreciation of organisation compared with the puerile discussions of such topics as 'Authority Structure' and 'Line vs. Staff' that were common in the mainstream academic discussion of the day. Elias Canetti, the Nobel Prize-winning author of this book, would be unhappy to learn that he's now best known as Iris Murdoch's one-time lover. I had heard that he was the prototype of the diabolical Julius King in A Fairly Honourable Defeat, and I'd also read various lurid accounts of their affair. Among other things, Canetti's wife used to greet Murdoch with a smile when she turned up for their trysts and then make lunch for all of them afterwards; as you can see, a cult leader kind of person Elias Canetti, the Nobel Prize-winning author of this book, would be unhappy to learn that he's now best known as Iris Murdoch's one-time lover. I had heard that he was the prototype of the diabolical Julius King in A Fairly Honourable Defeat, and I'd also read various lurid accounts of their affair. Among other things, Canetti's wife used to greet Murdoch with a smile when she turned up for their trysts and then make lunch for all of them afterwards; as you can see, a cult leader kind of personality. So I was curious to find out more about him, and, when Sherwood recommended Crowds and Power in the middle of a discussion thread last month, I went out and ordered a copy. Canetti is a genius. The chapter on power and violence should be a must read for every aspiring politician (not to mention the ones already in office). Se vi aspettate una fenomenologia della massa o le implicazioni sociologico-filosofiche del potere o gli arrovellamenti morali e/o etici sulla persistenza del male nell’uomo (tutta roba che si distingue per il mantra di nozioni di cui si è persa la fonte e che traggono la loro autorevolezza appunto dalla ripetitività), Canetti non è il vostro autore. E se c’è un testo che sbeffeggi, riduca in poltiglia e getti ai porci le finte perle freudiane dell’io e le masse o la ‘scoperta’ dell’essenza della paranoia che, guarda caso, è figlia primogenita dei rigurgiti libidinosi di gonadi malfunzionanti di un certo Schreber (biografo della sua follia)“, è proprio Massa e Potere. E se c’è un autore che abbia fatto strame in una botta di iperspecialisti antropologi, sociologi, psicologi e filosofi questo è Canetti che, non a caso, è stato rubricato, da questi giudici austeri e militanti severi, come scrittore tout court. Ma non sono i poeti che, come dice Lacan, ci introducono a una nuova dimensione dell’esperienza? Se c’è uno "sguardo" che dimostra irrevocabilmente come "l'ontogenesi ricapitoli la filogenesi”, ed è quello di cui andate in cerca: accomodatevi. Lui ‘cosa’ violentemente l’insondabile complessità della psiche umana, riducendola ad una animalità filogeneticamente inconfutabile: la sopravvivenza legata a doppio filo all’annientamento del maggior numero di competitor possibili. Sopravvivenza nell’accezione di vivere sopra gli altri, dominare gli altri, uccidere gli altri e nutrirsi di loro. Non siamo ognuno di noi dei sopravvissuti nella lotta senza quartiere con milioni di spermatozoi, sui cui ‘cadaverini’ abbiamo troneggiato raggiungendo la meta? Tutto inizia nella notte dei tempi in cui esigui gruppetti di ominidi vagano in preda alla paura delle belve, che li spinge a stringersi fisicamente tra loro, in cristalli di massa, aggregamenti primordiali delle masse. E poiché non voglio rompervi i cabbasisi con un trattatello di banalità, azzardo, a mo’ di esemplificazione (che Canetti mi perdoni), di immaginarci sospesi tra quei pochi indimenticabili minuti del “The Dawn of Man”, incipit di 2001 Odissea nello Spazio (parte dedicata alla genesi della massa); o rinchiusi nella cella di isolamento con Renfield, il folle zoofago cumulativo di ‘Dracula il Vampiro’ di Bram Stoker : crede che più anime ingerirà più vivrà a lungo e più acquisterà meriti agli occhi del suo signore e padrone, Dracula, ( parte dedicata al potere con l’equazione morte =potere=paranoia esemplificata nel caso Scherber). L’intuizione di un ominide dell’uso di un femore di carcassa animale come arma contundente è all’origine dell’inscindibile coppia massa/potere, in cui il potere è quello di vita o di morte di un singolo o di una muta sulle masse consenzienti. L’antropologo Canetti ne rintraccia le orme inconfutabili nelle culture degli aborigeni australiani, nelle tribù primitive dell’Africa subsahariana e in quelle amazzoniche, teorizzando una biopolitica delle masse e del potere alla base di tutte le civiltà che si sono succedute in milioni di anni. Un percorso che arriva quasi immutato ai nostri giorni, in cui il ‘quasi’ è da attribuire alle capacità di metamorfosi proprie dell’uomo che, con l’uso di maschere, può ingannare per sopravvivere alla minaccia (se è un sottoposto) o per mantenere il potere (se è il potente). "L’errore spaventoso sta nell’espressione ‘l’uomo’ - dice Canetti - l’uomo non è un’unità: contiene in sé tutto ciò che ha violentato. Tutti gli uomini lo contengono, ma non in ugual misura; possono quindi farsi l’un l’altro il peggio. Hanno la caparbietà e la forza per giungere allo sterminio totale". Se il potere è sopravvivenza, la sua forma più “bassa” e violenta, ma anche più diffusa tra noi umani, consiste nell’uccidere: l’uomo è un animale pericoloso (Hobbes) «vuole uccidere per sopravvivere agli altri». La “schiavitù della morte è il nocciolo di ogni schiavitù”. È la minaccia di morte a rendere possibile l’esercizio del potere: è perché sa, o sente, di poter essere ucciso da un altro essere umano, che l’uomo gli si sottomette. L’antropologia canettiana del potere tiene conto, però, della storia. Nella modernità, la sovranità non sparisce ma si trasforma : “non si tratta più (o non solo) di infliggere a capriccio la condanna capitale, ma – dopo averlo nutrito, ingrassato e ingrandito a dismisura – di mandare al macello il popolo-massa, per potergli sopravvivere”. A chi subisce o accetta il potere si promette, come ricompensa, un po’ di vita – un ragionevole, quasi godibile rinvio della morte-. Come Dracula con Rensfield o Dio con Schreber, che si trasforma in donna per essere amato dal supremo illudendosi di poterlo dominare. Già, perché anche il potente sopravvissuto ha la sua spina: quello di essere annientato dall’ultimo sopravvissuto. Vive nel terrore. La cosiddetta modernità ha sotterrato, come fa istintivamente il gatto, i suoi escrementi sotto un sottile strato di ghiaietta: i parlamenti da cui è bandita la morte. Ma basta grattare un poco che il marciume torna a galla, marciume impresso profondamente nel nostro paleoncefalo, costituito da cellule e da sinapsi e non dall’inconoscibile subconscio e dove alberga il mostro della paranoia che, in condizioni date, può mostrarsi nuda e cruda nella follia conclamata o sotto forma di potere nel reale. Ogni potente agisce sulla massa la sua paranoia perché in essa, come dimostra il caso Scherber*o il folle di Stocker, sono rappresentati tutti gli organi del potere, tutte le peculiarità del sopravvissuto compreso il delirio d’onnipotenza e tutti gli elementi del potere: l’accrescimento e l’immortalità conseguita con l’annientamento dei viventi individuati nei nemici e nei sodali sopravvissuti all’inadempimento, reale o pretestuoso, del comando da lui impartito. “Le memorie di un malato di nervi” sono la dimostrazione scientifica della sua, a prima vista, azzardata ipotesi: il potente e il paranoico, etichettato clinicamente come tale, sono le due facce della stessa medaglia. Solo le circostanze storico ambientali ne permettono l’una o l’altra espressione. E nessuno di noi è immune. Il potere slaterizza il paranoico che è in noi. Comunque, dice Canetti, nella contemporaneità l’unica massa sopravvissuta è quella dell’accrescimento: se c’è una fede di cui diventano preda l’un dopo l’altro i popoli è la fede nella produzione, il moderno furore dell’accrescimento. Per vendere, la produzione necessita di un numero sempre maggiore di uomini. Le masse di guerra non vogliono più uccidersi a vicenda ma superarsi a vicenda. L’oriente e l’occidente sono due enormi masse doppie. La Germania nazista fu l’ultima, per Canetti, ad usare la guerra come mezzo per un rapido accrescimento. Il saggio è pubblicato negli anni sessanta quando la corsa al nucleare ha trasformato il delirio di sopravvivenza del potente in un cupio dissolvi che ha disinnescato, suo malgrado, il detonatore del potere di morte reciproco sulla massa avversaria e trasformandolo nella suprema e insopportabile sconfitta che è, per il potente, il suicidio. L’orribile periodo da lui vissuto è ormai passato e anche le religioni si davano per morte. Che ne poteva sapere Canetti del revival dell’islam integralista, religione di guerra come lui l’aveva definita, in piena attività di delirio di potenza? Alla profonda e per certi versi terrorizzante analisi, proprio alla fine segue un’esortazione a che la massa estirpi definitivamente la spina del comando del potere: se si vuole riuscire ad aggredire il potere si deve guardare negli occhi senza timore il comando e trovare i mezzi per sottrargli la sua spina. In parole povere, ognuno deve indagare dentro la propria paranoia, affrontando la paura e rifiutando il comando di fuga dentro una massa, estirpando il desiderio di sopprimere o di servirsi degli altri per rimanere l’ultimo, il sopravvissuto. L’amore non basta, dice il prosaico antiromantico Canetti. Conclusione troppo frettolosa, tanto per dire qualcosa? L’unico appunto che mi sento di fargli. * “Il caso Schreber, noto soprattutto perché analizzato da Freud nel 1910, è oggetto di un’ampia revisione con lo scopo non tanto nel confutare indirettamente l’interpretazione psicoanalitica del delirio di Schreber – poiché è evidente il carattere riduttivo della chiave ‘omosessuale’ utilizzata da Freud a fronte della ricchezza di questo delirio – , quanto nel mostrare la natura politica della paranoia dell’ex giudice tedesco. La sua follia, sotto il travestimento di un’antichissima visione del mondo che presuppone l’esistenza di spiriti, è in realtà il preciso modello del potere politico che si nutre della massa e da essa è costituito”. Nell’Anti-Edipo, Deleuze e Guattari hanno riconosciuto a Canetti il merito di aver sottratto la paranoia, “malattia di potere”, ad ogni “imperialismo dell’Edipo”. Van Elias Canetti (Nobelprijs 1981) heb ik het nodige gelezen, en vooral "Het Martyrium" vond ik echt geweldig. Maar zijn essayistische hoofdwerk "Massa en Macht" las ik nu pas. Dat had eerder gemogen, want dit was echt een meesterwerk in de buitencategorie. Ik ben volkomen flabbergasted, euforisch en overdonderd. Ja, ik hou van lezen en bejubel veel boeken, maar dit boek is van zo'n zeldzame klasse dat ik mij eigenlijk totaal onmachtig voel om er ook maar iets over te zeggen. 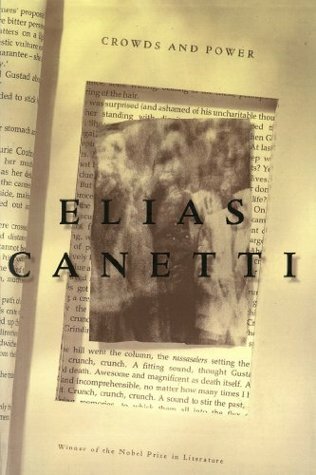 Het is een geniaal Van Elias Canetti (Nobelprijs 1981) heb ik het nodige gelezen, en vooral "Het Martyrium" vond ik echt geweldig. Maar zijn essayistische hoofdwerk "Massa en Macht" las ik nu pas. Dat had eerder gemogen, want dit was echt een meesterwerk in de buitencategorie. Ik ben volkomen flabbergasted, euforisch en overdonderd. Ja, ik hou van lezen en bejubel veel boeken, maar dit boek is van zo'n zeldzame klasse dat ik mij eigenlijk totaal onmachtig voel om er ook maar iets over te zeggen. Het is een geniaal en ongelofelijk origineel essay van ruim 600 bladzijden, in twaalf briljante essayistische hoofdstukken waarin elke paragraaf ook weer een parel is van essayistische eigenzinnige schrijfkunst. Canetti schrijft adembenemend over massa's en meutes, en over de vele verschillende vormen (inclusief de biologische oervormen), functies en verlokkingen daarvan. En nog adembenemender schrijft hij over talloos verschillende vormen van macht, en over de biologische oervormen van het bevel. Daarmee reageert hij uiteraard op de angstwekkende massa en macht- fenomenen die we leerden kennen in met name de Tweede Wereldoorlog, maar ook nog erna. En toch vallen de namen Hitler en Stalin maar heel sporadisch. Want Canetti's invalshoek is ongehoord origineel: de zo brandend actuele verschijnselen massa en macht exploreert hij niet door een grondige analyse van de moderne geschiedenis, maar door een even eigenzinnige als meeslepende exploratie van tientallen mythen uit alle windstreken, van tientallen antropologische teksten over natuurvolkeren of vergeten exotische vorsten, en dat dan gecombineerd met uiterst minutieuze en originele bespreking van teksten van en over schizofrenen, paralytici, lijders aan paranoia en meer. Waarmee hij zijn overtuiging demonstreert dat juist de pre-logische wereld der mythen ons veel te zeggen heeft, zeker over massa en macht. En dat juist de grotesk uitvergrote waanbeelden van geesteszieken ons veel kunnen leren over de pre-logische aspecten van onze waanzinnige wereld. Hij doet dat alles niet op de logisch-systematische wijze van de wetenschapper: zijn bronnengebruik getuigt weliswaar van een overdonderende eruditie, maar zijn interpretatie van die bronnen is steeds enorm persoonlijk, en zijn conclusies zijn in mijn beleving vaak niet met heel veel logische argumenten onderbouwd. Maar die conclusies zijn wel enorm pregnant geformuleerd, en wel enorm overtuigend als verhaal of als literair beeld. Volgens mij kun je niet volhouden dat Canetti in "Massa en Macht" de fenomenen "massa" en "macht" op wetenschappelijke wijze heeft geanalyseerd en ontleed. Maar hij geeft wel enorm pregnante invalshoeken op die beide fenomenen, die je nergens anders vindt. En hij maakt daarmee ervaringsintensiteiten voelbaar of zichtbaar die je in een conventionele wetenschappelijke of beschouwelijke tekst niet zult zien. De eerste zinnen van het boek luiden bijvoorbeeld: "Voor niets is de mens meer beducht dan voor aanraking door iets onbekends. [...] Overal gaat de mens de aanraking door een vreemd element uit de weg. 's Nachts, of ook gewoon in het donker, kan de schrik om een onverwachte aanraking in paniek ontaarden. Zelfs de kleren waarborgen niet genoeg veiligheid; hoe gemakkelijk zijn ze niet te verscheuren, hoe gemakkelijk is het niet om tot het naakte, weerloze vlees van de aangevallene door te dringen. Alle afstanden die de mensen om zich heen geschapen hebben, zijn door deze aanrakingsvrees ingegeven. Men sluit zich in huizen op waarin niemand mag binnenkomen; slechts daarin voelt men zich ten dele veilig. De angst voor de inbreker geldt niet alleen zijn roofzuchtige bedoelingen, ze is ook een vrees voor zijn plotselinge, onverwachte greep uit het donker. De hand, tot klauw gevormd, wordt als symbool voor deze angst altijd weer gebruikt. Relevant is in dit opzicht de dubbele betekenis van het Duitse woord angreifen. Zowel de onschuldige aanraking als de gevaarlijke aanval ligt erin besloten, en iets van het laatste klinkt in het eerste altijd door". Geweldige zinnen, naar mijn smaak. Ze verklaren niets: nergens staat immers waarom de mens de aanraking door het onbekende vreest of zou moeten vrezen. Maar deze zinnen maken door de kracht van hun formulering wel de irrationele intensiteit van deze oerangst fraai voelbaar. Vind ik. Met soortgelijke, even essayistische als eigenzinnig-indringende zinnen, maakt Canetti snel daarna al even voelbaar dat het noodzakelijk is om je te verschansen achter muren om deze angstwekkende aanraking door het onbekende te voorkomen. Maar ook dat die muren vervolgens weer enorm beklemmend zijn, omdat ze leiden tot isolatie en onverbondenheid. En dat, suggereert Canetti met nog meer van die denderend suggestieve Canetti-zinnen, verklaart de verlokking van de massa: in de massa vormen mensen samen één lichaam, zijn alle isolerende barrières opgeheven, en is ook de panische aanrakingsvrees overwonnen. Ziedaar de verlokking van de massa. Die Canetti vervolgens met allerlei voorbeelden uit mythen en antropologische bronnen nog weer extra vorm en inhoud geeft, op meeslepende wijze. Op vergelijkbare, maar naar mijn smaak nog meeslepender wijze geeft Canetti vorm en inhoud aan het begrip "macht". Het is voor mij uiteraard onmogelijk om alle facetten van Canetti's machtsbegrip hier toe te lichten, te meer omdat ik zijn boek nog wel een paar keer zal moeten lezen om alle rijkdom van dit begrip te doorgronden. Maar echt exceptioneel imponerend vond ik het hoofdstuk "De overlevende", waarin Canetti ons via diverse mythische, exotische en historische verhalen confronteert met een genadeloze hypothese: leiders willen overleven, en putten hun kracht uit de duizenden of zelfs miljoenen die sterven. Niet alleen vijanden, maar ook vrienden of mensen uit het eigen volk. En in latere hoofdstukken maakt hij helaas maar al te aannemelijk dat paranoia en grootheidswaanzin structurele componenten zijn van elk leiderschap. Van Hitler, maar ook van Dzjengis Khan, vele koningen of aanvoerders van exotische volkeren, en vele grote leiders in oude mythen. Maar ook, in meer gedomesticeerde vorm, van diverse veel beschaafde leiders nu. De minder beschaafde leiders hebben nu veel meer mogelijkheden om daadwerkelijk miljoenen te vermoorden en als enige te overleven. Of, in Canetti's hamerende woorden: "Dzjengis Khan! Timoer Lenk! Hitler! - aan onze mogelijkheden afgemeten erbarmelijke beginnelingen en sukkels!" De meer beschaafde leiders zullen weliswaar geen hele dodenakkers op hun geweten willen hebben, maar zullen ook de nodige destructie teweeg brengen, zij het in gedomesticeerde vorm. Want er is geen leiderschap denkbaar zonder bevel. En in elk bevel, ook zin zijn meest gedomesticeerde en milde vorm, is volgens Canetti nog de oervorm en biologische grond voelbaar waaruit het bevel ontstond: de schreeuw van het roofdier die hele massa's in paniek deed vluchten. Elk bevel is bovendien als een pijl, die een angel nalaat in degene die het bevel heeft moeten opvolgen: een "kristal van rancune" dat als een soort vreemd lichaam in het eigen innerlijk voortleeft en doorettert. Elk kind heeft meerdere bevelen moeten opvolgen, elke ondergeschikte heeft tientallen van zulke angels moeten oppotten in zijn lichaam. En er is maar één manier om verlichting te vinden: anderen bevelen zoals je zelf ooit bent bevolen, zodat je de eigen pijnlijke angels en kristallen van rancune in een ander overplant. Dit is nog maar een flintertje van wat Canetti ons vertelt over macht en bevel, en ik kan geen recht doen aan zijn rijke en uit vele bronnen puttende essayistiek. Maar ik hoop dat ik althans iets over weet te brengen van zijn werkelijk genadeloze boodschap. Want hij is ten eerste knokenhard over de gevaren van machthebbers, die hij vermoedelijk ook vermoed in democratisch gekozen machthebbers. En hij is snijdend meedogenloos over de paranoïde of rancuneuze of schizofrene kantjes van iedereen die anderen beveelt, hoe beleefd soms ook. Maar bovendien laat hij in spaarzame korte bijzinnen duidelijk merken dat iedereen te maken heeft met macht, zowel door bevelen uit te oefenen als bevelen te ondergaan. Ik heb dus angels in mij door bevelen van anderen, anderen hebben angels in zich door bevelen van mij. Ik heb door bijvoorbeeld kritische vragen te stellen of in discussies net wat behendiger te zijn kristallen van rancune in anderen achter gelaten. Anderen hebben dat bij mij gedaan door soms net wat rapper of slimmer te zijn dan ik, en daarvoor stel ik mij dan schadeloos door later een keer rapper te zijn dan zij of door mij af te reageren op mijn vrouw of mijn vrienden. Ja, het is vreselijk maar het is waar: ook ik pot angels op, ook ik ontlast mij daarvan ten koste van anderen. Canetti is genadeloos over machthebbers, en radicaal ontnuchterend over hun soms volkomen destructieve en paranoïde overleversdrift. Maar hij is ook genadeloos over u en mij. En dat is misschien nog wel confronterender. Behalve genadeloos is Canetti echter ook appellerend. Hij sluit "Massa en Macht" af met de woorden: "Wie de macht wil aanvatten, moet het bevel onder ogen zien en de middelen vinden om het van zijn angel te beroven". En daarvoor schreef hij: "Van welke kant men het ook bekijkt, het bevel in de compacte, afgeronde vorm die het na een lange geschiedenis tegenwoordig heeft, is het gevaarlijkste afzonderlijke element in de samenleving van de mensen geworden. Men moet de moed hebben zich ertegen te verzetten en zijn heerschappij aan het wankelen te brengen. Er moeten middelen en wegen worden gevonden om het grootste deel van de mens ervoor te vrijwaren. Men mag het niet toestaan meer dan de huid te schrammen. Zijn angels moeten tot pluisjes worden die men met een lichte beweging wegstrijkt". Opzwepende en inspirerende woorden, vind ik. Tegelijk echter wel zeer moeilijk op te volgen, want er is -zo suggereert ook Canetti- nauwelijks interactie mogelijk zonder elementen van macht en bevel. Bovendien werkt hij in "Massa en macht" niet expliciet uit wat die middelen en wegen zijn om zich voor het bevel te vrijwaren. En toch bevat dit magnifieke boek volgens mij belangrijke en inspirerende suggesties om ons te wapenen tegen de macht van het bevel. Niet voor niets gaat het boek na de laatst geciteerde woorden verder met een nieuw hoofdstuk getiteld "De metamorfose" (die Verwandlung). In dat hoofdstuk (maar ook in eerdere en latere) liet Canetti al doorschemeren dat metamorfose en gedaanteverandering het tegendeel zijn van wat een machthebber beoogt. Immers, de machthebber wil eeuwig en onveranderlijk aan zichzelf gelijk zijn in een wereld die gefixeerd is omdat hij aan de machthebber gehoorzaamt, terwijl metamorfoses horen bij een fluïde wereld waarin alles voortdurend verandert. Bovendien, in o.a. de door Canetti prachtig geparafraseerde Bosjesmannen- mythes betekent metamorfose ook vergaande identificatie: de Bosjesman voelt het naderen van springbokken omdat hij als het ware het gras aan zijn voeten voelt dat de mijlen verderop rondlopende springbok aan zijn poten voelt, en dat betekent dat de Bosjesman zich zo sterk in springbokken verplaatst dat hij ZELF een springbok WORDT. Wat voor de Bosjesman geen fantasie is, maar realiteit: als het al "verbeeldingskracht' is, dan gaat het om verbeeldingskracht die ingrijpt in de fysieke werkelijkheid. Dat soort identificatie, waarbij het ik door totale inleving daadwerkelijk in de ander metamorfoseert, is de machthebber uiteraard een gruwel. En het is het tegendeel van het bevel waarin ik de ander tot iets dwing of iets opleg. In zijn latere, prachtige essay "Das Beruf des Dichters" (in de prachtbundel: "Das Gewissen der Worte") omschreef Canetti de dichter dan ook als hoeder van "Verwandlungen": juist dichters en schrijvers kunnen, volgens Canetti, door de kracht van hun verbeeldingskracht en inlevingsvermogen, erin slagen om de metamorfose op zijn minst te benaderen. Zij zijn niet, zoals de bevelende machthebber, star aan zichzelf gelijk, maar verplaatsen zich bijvoorbeeld in fictieve personages en WORDEN dan voor even die personages, of WORDEN voor even die jubelende vogel uit hun gedicht. Kortom, het hoofdstuk over de metamorfoses lijkt mij mede bedoeld als inspiratiebron voor een fluïde, veranderlijke vorm van denken die althans ten dele ontsnapt aan de starre wereld van het bevel. Maar misschien geldt dat nog wel sterker voor de eigenzinnige en uiterst creatieve opzet van het boek als geheel. Want Canetti houdt zich in "Massa en Macht" aan geen enkele conventie, dus aan geen enkel bevel dat dicteert hoe een boek hoort te zijn. Waar een normale analyse van massa en macht vooral de contemporaine geschiedenis had geëxploreerd, daar put Canetti - op ook nog eens ongehoord creatieve en oorspronkelijke wijze- uit mythen, antropologische bronnen en analyses van geestesziekten. Waar een normaal non-fictie boek ons poogt te overtuigen met argumentatie en logica, daar betovert Canetti ons met ongehoord originele essayistiek en met de enorme kracht van zijn metaforische beelden. Door die kracht van zijn beelden is dit boek erg literair, terwijl het non-fictie is; door de enorme eruditie ervan (zie alleen al de ellenlange bronnenlijst aan het slot) is het erg wetenschappelijk en dus weer niet literair; door de keuze voor een essayistisch-literaire stijl en vorm in plaats van een analytisch-verklarende is het echter weer niet wetenschappelijk. Dit boek geeft ongehoord originele en inspirerende inzichten in de fenomenen massa en macht, en de inzichten in macht en bevel zijn naar mijn smaak zelfs snijdend en verontrustend. Ze ontmaskeren en ontwapenen daarmee ten dele de machthebber tegenover ons en in ons. Maar tegelijk laat dit boek ons honderden bladzijden verbijsterd genieten van een voortdurend volkomen originele en oorspronkelijke geest: de geest van iemand die alles op zijn eigen, hoogst singuliere wijze doordenkt en formuleert, zonder zich te storen aan welk bevel van welke conventie dan ook. Een geest die beweegt van Bosjesmannen naar Hunnen naar Indiaanse mythen naar Hitler naar de paranoïde Schreber naar Perzische koningen en terug. Een geest die bodemloze en onuitputtelijke eruditie paart aan vaak aforistische, soms groteske en bizar beeldende schrijfkunst. Wat dan een boek oplevert dat onuitputtelijk rijk is maar vooral onuitputtelijk verrassend en ongrijpbaar. En zo tot een monument wordt voor een wijze van denken die aan de rigiditeit van macht en bevel ontsnapt. The best insights can sometimes come from meandering pathways. Elias Canetti (a Nobelate in 1981) seems to embody an interdisciplinary fervor in order to uncover patterns related to power and corruption. Armed with a lifetime of reading in anthropology, psychology, political science and rhetoric--and equipped with a life traversing totalitarian governments, two world wars and knowledge of numerous languages--he weaves together stories of ancient and all-but forgotten cultures (to me, at least) i The best insights can sometimes come from meandering pathways. Elias Canetti (a Nobelate in 1981) seems to embody an interdisciplinary fervor in order to uncover patterns related to power and corruption. Armed with a lifetime of reading in anthropology, psychology, political science and rhetoric--and equipped with a life traversing totalitarian governments, two world wars and knowledge of numerous languages--he weaves together stories of ancient and all-but forgotten cultures (to me, at least) in order to draw implications for modern times. Though confusing at times--though his conclusions often require tremendous leaps of faith--and in spite of the hordes of implicit arguments the reader must tweeze from the haystack, the book is quite profound. It feels epic because of the multitudinous stories. It feels cumbersome because of the vast logic he employs to outline his theories. He uses many neologisms--constructing, as he goes, a new language with which to view discourses on power. He is profound. And in my attempts to regard his legacy in contemporary studies, I am surprised to see a near-total absence. Perhaps, to do justice to this erudite (although perhaps eccentrically so) scholar, we should all take him up again. Interesting view of the behavior of crowds and leaders and how they interact and grow. Uses many anthropoligical examples, although some links are more tenuous than others. Extremely interesting. Sono troppo sopraffata per esprimere un giudizio articolato, nel caso poteri fare una classificazione aka lista da far invidia a Perec del perché questo testo è un'accozzaglia, pardon, un lungo susseguirsi senza filo, di brandelli di pensieri senza capo né coda su cosa sia la massa. Illustrati con ampi (ampissim) stralci di etologia – forse con sfumature enologiche - e antropologia, ma, francamente, a patto di non esser interessati alla vita particolareggiatamente descritta nei suoi momenti topi Sono troppo sopraffata per esprimere un giudizio articolato, nel caso poteri fare una classificazione aka lista da far invidia a Perec del perché questo testo è un'accozzaglia, pardon, un lungo susseguirsi senza filo, di brandelli di pensieri senza capo né coda su cosa sia la massa. Illustrati con ampi (ampissim) stralci di etologia – forse con sfumature enologiche - e antropologia, ma, francamente, a patto di non esser interessati alla vita particolareggiatamente descritta nei suoi momenti topici, di parecchi popoli primitivi (e non ho detto selvaggi!) il tutto risulta di un tedio che nemmeno padre e figlio Angela insieme. Ecco perchè – avvalendomi dei benedetti e Sacrosanti Diritti del Lettore di Pennac – ho girato le pagine al ritmo vorticoso di un danzatorte derviscio, non appena mi imbattevo in queste scene di vita (3/4 del libro). Che poi la massa equivalga a un potere è una tautologia che sa chiunque sia capitato dentro uno stormo di api, o in una tempesta di vento e pioggia (vero Elias?). Nobel Prize per questo libro. Contrariamente a quanto ho finora borbottato, il decadimento del Premio Nobel arriva da lontano. I'll start by saying that I liked reading Crowds and Power, was deeply impressed by the concepts that Canetti develops and invokes, and entertained by the stories and myths he uses to buttress those concepts. But this isn't scientific analysis at all-- it's literature above all else, and should be read in that light. Keep in mind that Canetti was writing in the structuralist heyday of the late '50s and early '60s-- this was a time when Marshall McLuhan was doing his thing with media, and when the I'll start by saying that I liked reading Crowds and Power, was deeply impressed by the concepts that Canetti develops and invokes, and entertained by the stories and myths he uses to buttress those concepts. Masse et puissance m'est d'abord apparue comme une oeuvre d'imagination généreuse mais sans plan, lancée voire gaspillée en généralisations outrancières, en analogies douteuses et superficielles, en classifications inutiles, en tautologies, et en objectifs nobles - mais abandonnés aussitôt que déclarés. Ces impressions demeurent un temps puis disparaissent, presque entièrement. Le propos de Canetti s'échafaude sur des classifications et des métaphores, et sur de nombreuses incursions dans les Masse et puissance m'est d'abord apparue comme une oeuvre d'imagination généreuse mais sans plan, lancée voire gaspillée en généralisations outrancières, en analogies douteuses et superficielles, en classifications inutiles, en tautologies, et en objectifs nobles - mais abandonnés aussitôt que déclarés. Ces impressions demeurent un temps puis disparaissent, presque entièrement. Le propos de Canetti s'échafaude sur des classifications et des métaphores, et sur de nombreuses incursions dans les grands exclus de la raison qui en font l'originalité et la richesse. On trouve ainsi plusieurs paraphrases ou citations in extenso d'observations et journaux cliniques - paranoïa, delirium tremens, schizophrénie, paralysie -, de mythologies totémiques et chamaniques, de portraits des despotes et rois africains, mongoles, indiens, chinois des siècles reculés. Le tout, parvenu à un certain stade (la 350e page environ), prend relief et consistance, et dévoile sa systématicité. L'esprit de croissance dont Canetti repérait, déjà, le partage et le culte à l'est comme à l'ouest (parmi des blocs "armés jusqu'aux dents et bientôt jusqu'à la lune"), est illuminé dans ses ressorts intimes et dans ses anciens encastrements rituels (guerriers, chasseurs et funèbres) dont il s'est émancipé pour leur ravir la palme. On dépose Masse et puissance avec le sentiment qu'un peu du mystère de notre malédiction est levé. Et puis la satisfaction d'avoir terminé le livre cède sa place aux interrogations et agacements. Les notions et concepts de la philosophie et anthropologie sont réputés, comme ceux du sens commun, pour leur caractère polysémique, équivoque, et redondant (désignant une même réalité construite par convention : symbole, sens, signification ; culture, société, structure). Canetti ne fait pas exception. Il se peut, pour reprendre un terme de Aron (sa critique de Marx), que le charme et la puissance d'envoûtement de Masse et puissance soient en partie l'effet d'un opium intellectuel : celui de concepts dont la force et les vertus explicatives croissent en proportion de la multiplicité, équivocité de leur usage, et du caractère à terme vague et indécidable de leur définition. La métamorphose dont Canetti nous dit qu'elle est l'objet d'un interdit des plus centraux dans l'organisation sociale (402) est un cas d'espèce. Puisant son inspiration des mythes totémiques australiens, cette notion consiste, en apparence, en un usage de ceux-ci au sens littéral. Au temps fondateur, les ancêtres revêtaient réellement une forme humaine en alternance avec une forme animale, et au moment de performer leurs rites, les clans totémiques actualisent cette métamorphose ; Canetti allant dans ce contexte jusqu'à dire qu'elle est l'apanage de notre espèce. Les rites sont une forme stabilisée de passage de forme humaine à animale. Il suffit de lire une description ethnographique des rites totémiques pour contredire un tel usage. Métamorphose est ensuite employée dans des directions qui, hors des contextes à religion totémique, semblent irréconciliables et non cohérentes avec ce premier usage (déjà discutable). Par cette métamorphose sur laquelle les sociétés à religion transcendante et subjectivée placent l'interdiction, Canetti entend "mobilité" ascendante (ou descendante), changement de caste ou d'ordre. Les castes ont un caractère englobant plus que certain. Substantielles, elles ne sont pas extérieures à l'individu, comme aujourd'hui son emploi ou ses occupations. Elles sont sa position dans le tout cosmique, auquel appartiennent un degré de dignité, une essence, des droits et obligations propres. Mobilité, changement de caste, équivaut donc effectivement à métamorphoses, mais ce n'est pas certain. Canetti ne fournit aucune indication à l'effet qu'il y ait ici une identité ou correspondance avec le sens littéral des mythes et religions totémiques (identité fausse et sens littéral discutable), ni qu'il y ait différence et raison d'absorber celle-ci dans le même concept. Per le sezioni sulla psicologia, Canetti si rifà a Emil Kraepelin, attivo nel XIX secolo. Anche le ampie citazioni di antropologi, per altro spesso assai interessanti, non sembrano delle più recenti. Pubblicato nel 1960, Massa e potere sembra fermo a un secolo prima, se non di più. Non solo per i riferimenti, ma per tutta l'impostazione. Il suo approccio al sapere è libresco, antiquario, letterario e poco propenso al confronto con l'empiria, con l'accidentata particolarità dell'empiria. La carenza di rigore concettuale o coraggio speculativo impediscono all'opera di fornire un qualunque spunto fecondo anche nei limiti del suo àmbito, quello della riflessione da scrivania priva di ambizione scientifica in senso stretto. La quale non è automaticamente condannata alla sterilità (penso ad esempio agli scritti sulla violenza di Wolfgang Sofsky). Ma in Canetti il risultato è una interminabile sequela di generalizzazioni sull'umano, prive di qualunque base concreta o argomentativa, prive di nessi tra loro. La sensazione è quella, singolare, di qualcuno che al giorno d'oggi provi a scrivere di fisica o chimica usando i metodi in voga al tempo d'Aristotele. La formazione del nazismo secondo Canetti. Il simbolo del popolo tedesco è la foresta. La foresta è simbolo dell'esercito. Il trattato di Versailles ha tolto alla Germania l'esercito. Il popolo tedesco, privo di esercito, ma sempre in cerca di comando, obbedienza e inquadramento militare ( > esercito > foresta) si è così intruppato nel partito nazista. La formazione del commercio nelle società umane secondo Canetti. I primati usano le mani per muoversi sugli alberi di ramo in ramo. La mano è fatta per afferrare il ramo e lasciarlo. Nel commercio le merci vengono prese e lasciate, afferrate e consegnate. Ergo, il piacere psicologico del commercio deriva dai tempi in cui i nostri pelosi antenati volteggiavano di ramo in ramo. I read about 1/3 of this during college days, oh so long ago, but in a very scattered manner, jumping from segment to segment. It had a large impact and I've been thinking about it quite a bit lately ... so it's time to go back and give it a more frontal assault. Finally through this intellectual thicket ... though I cannot claim to have digested it. This is a dense, magisterial work ... vast erudition is on display, yet somehow worn lightly. His concerns are so human that the abstractions take r I read about 1/3 of this during college days, oh so long ago, but in a very scattered manner, jumping from segment to segment. It had a large impact and I've been thinking about it quite a bit lately ... so it's time to go back and give it a more frontal assault. In libreria trovate questo saggio spesso e volentieri negli scaffali di filosofia. Definizione un po' riduttiva, perché Massa e potere racchiude in sé i più svariati campi del sapere: filosofia sì, ma anche antropologia (molto), sociologia (e in verità io la direi più opera sociologica che filosofica), storia, psicanalisi. Ecco, psicanalisi. Strenuo oppositore di Freud e della teoria psicanalitica tutta, Canetti si rivela uno dei più fini psicologi nei quali sia dato imbattersi. È un saggio ponderoso, ma non difficile da leggere. In realtà fa più soggezione che altro. One of the seminal books of the 20th century -- a synthesis of anthropology, sociology, deep psychology, political science, and folklore as channeled by a brilliant Romanian Jew who witnessed the rise and fall of Hitler and Stalin. So much that seems inexplicable about human behavior makes sense after reading this book. Quite intriguing to bizare... Canetti's views on power and crods are convincing and his examples taken mostly from Australian and African anthropology are most insightful. When he becomes too esoterical and to vague, especially in the last third when taking about mutation etc., it becomes hard to follow. None the less, quite an inspiration. A long-term dipping-into book. Recommended on a blog by Charles Lemos, at [now defunct] bythefault.com. Goes deeper and wider than Hoffer's "True Believer." Trivia: Canetti is thought to have been Iris Murdoch's model for The Black Prince. ¿sabéis lo que es leer un libro y que se repitan pasajes y situaciones en el sueño? → Paranoid yapıdaki bir insan asla affetmeyen ya da ancak büyük zorluklarla affeden, bunu düşünerek uzun zaman geçiren, affedilecek bir şeyi asla unutmayan ve affetmemek için kendisine karşı yapılmış düşmanca edimler icat eden bir insan olarak tanımlanabilir. Bu gibi insanların duyumsadığı çok kuvvetli iç direnç, her türden affetmeye karşı durur. Eğer iktidar elde ederler ve zaman zaman bu iktidarı korumak için affetmek zorunda kalırlarsa, bu yalnızca gösteri olarak yapılır; bir despot asla gerçekten affetmez. Kendisine gösterilen her bir düşmanlık işareti kesin olarak kaydedilir, saklanır ve daha sonrası için depoya kaldırılır. Bazen bu kayıt, gerçek boyun eğme karşılığında silinir: Despotların bariz yüce gönüllülüğünün başka hiçbir anlamı yoktur. Onlara karşı çıkan her şeyin kendilerine tabi olmasını öylesine ateşli bir biçimde isterler ki bunun için sık sık çok yüksek bir fiyat öderler. → İnsanlar bir kez çok sayıda köleyi, hayvanları sürüler halinde topladıkları gibi toplamayı başarınca, devletin tiranlığının temelleri atıldı. Bir yöneticinin bütün bir halka köle ya da hayvan gibi sahip olma arzusunun, halkın sayısıyla arttığı konusunda en ufak bir kuşku dahi duyulamaz. → Mütecaviz kitlenin hızlı büyümesinin önemli bir nedeni, hiçbir riskin bulunmamasıdır. Risk yoktur çünkü kitlenin sınırsız bir üstünlüğü vardır. Kurban, kitleyi oluşturanlara hiçbir şey yapamaz. Ya bağlıdır ya da kaçış halindedir, vurarak karşılık veremez; savunmasızlığı içinde yalnızca bir kurbandır ve yok edilmek üzere onlara teslim edilmiştir; buna yazgılıdır; böylelikle kimsenin adam öldürme cezasına çarptırılmaktan korkmasına gerek kalmaz. Onun izin verilmiş katli, insanların öldürme cezasının korkusu yüzünden işlemekten çekindikleri bütün cinayetlerin yerini tutar. Pek çok başka insanla paylaşılan ve yalnızca caiz ve tehlikesiz değil, üstelik teşvik edilen bir cinayet insanların büyük bir çoğunluğu için karşı konulmaz niteliktedir. Read this because of my growing interest in totalitarianism, and I had heard Canetti's name thrown around in a bunch of lectures. I was mildly disappointed in the result, given the size of the book. It wasn't so much that I thought he didn't have anything interesting to say about crowd dynamics and psychology. The first 100 pages or so are very interesting in this respect as he explores multiple types of crowds. However, what really turned me off for much of the book was the method. Much of Cane Read this because of my growing interest in totalitarianism, and I had heard Canetti's name thrown around in a bunch of lectures. I was mildly disappointed in the result, given the size of the book. It wasn't so much that I thought he didn't have anything interesting to say about crowd dynamics and psychology. The first 100 pages or so are very interesting in this respect as he explores multiple types of crowds. However, what really turned me off for much of the book was the method. Much of Canetti's real concern wasn't so much about crowds as a it was about human beings' physical and psychological relations to power and meaning. He explores this idea largely through myth and anthropology: he unpacks old anthropological accounts of rituals and practices to try to get at a more essential human relationship to power, movement, physical location, dance, and other raw physical phenomena. This is occasionally interesting, but as a whole the argument is too winding, long-winded, and poorly structured. I would have rather encountered his ideas in lecture form rather than their sprawling depiction here. Lastly, I wish he had more directly approached the modern urban political crowd in the Western context. It seems like this book was probably motivated by the rise of the crowd in the first half of the 20th century and the experience of the great dictators. It was weird and disappointing to me that he didn't have at least a chapter out of 470 pages to explore this. Even though I did not understand this book entirely, it made a considerable change in my way of thinking and looking at matters concerning not only crowds and power, but also other human activities and behaviors. I hope I will reread this book after a few years with a more improved and developed mind, and will be able to grasp better the concepts explained by this Nobel winning author. Awarded the 1981 Nobel Prize in Literature "for writings marked by a broad outlook, a wealth of ideas and artistic power." He studied in Vienna. Before World War II he moved with his wife Veza to England and stayed there for long time. Since late 1960s he lived in London and Zurich. In late 1980s he started to live in Zurich permanently. He died in 1994 in Zurich. Author of Auto-da-Fé, Party in the Awarded the 1981 Nobel Prize in Literature "for writings marked by a broad outlook, a wealth of ideas and artistic power."